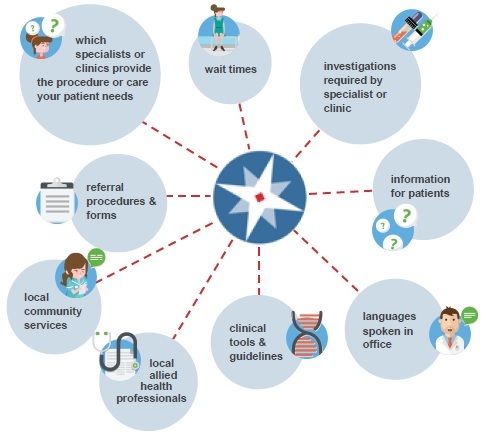 Pathways is a ‘made in BC’ resource that allows GPs and their office staff to quickly access current and accurate referral information, including wait times and areas of expertise, for specialists and specialty clinics. Currently, Pathways has information on over 3,500 specialists and 850 clinics. In addition, Pathways makes available hundreds of patient and physician resources that are categorized and searchable. Allowing GPs to identify the most appropriate specialist with the shortest wait time. Simplifying the patient referral process by easily identifying specific areas of practice offered by each specialist and clinic. Providing GPs with the most up-to-date information possible to ensure appropriateness of referrals. Decreasing the incidence of re-referrals, thereby increasing the efficiency of patient care. Click here for an introductory tour of Pathways. Since its inception, Pathways continues to spread throughout the Province and is now available at no charge to Port Alberni physicians who are members of the Port Alberni Division of Family Practice. 97% of users report that Pathways has improved the referral process. If you are a primary care provider in Port Alberni, consider joining the Port Alberni Division. It is a group of Port Alberni family physicians, supported by the General Practice Services Committee (GPSC). How does the Division benefit physicians in our community? We work with the Ministry of Health, GPSC and the Health Authority, and access funding to develop community-specific programs that enhance patient care and improve our professional satisfaction. As a member, you can help strengthen local primary health care with your experience and insights. Participation is not mandatory, but it helps all Family Physicians improve conditions, programs and health (both ours and our patients).